"Departed Warriors" takes the reader from the shores of Britain with the first volunteer army to leave for South Africa to fight in the Second Boer War, to the battlefronts of the Great War of 1914-18 and finally into the skies of the Second World War. It is the account of two generations of a family who fought for their country and the impact it had upon their lives. Using archive material and family records in the form of letters, photographs and diaries, the reader is taken on a journey to the heat and dust of South Africa, the trenches of the Western Front, the wretchedness of the Mesopotamian Campaign and the beaches of Gallipoli. 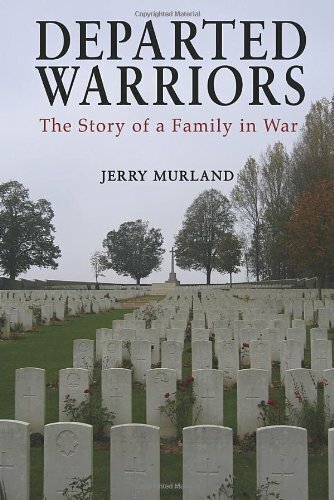 Twenty two years later, family members took to the skies and the book traces the training and operational record of three RAFVR pilots.The author has described his family as 'warriors', for that is exactly what they were: fighting men in the uniform of their country answering the call to arms. The majority of them did their duty conscientiously and courageously, several were decorated for gallantry, but others inevitably chose a path that would, as far as possible, circumvent the dangers of front line service and increase their chances of remaining relatively unscathed. This book also explores the family's considerable Irish connection. The Murlands, being linen manufacturers, were part of the wealthy Ulster 'Linenocracy'. Their involvement in the Ulster Volunteer Force, prior to the outbreak of war in 1914, provides a fascinating personal insight into the Irish political scene at the turn of the Century and sets the scene for a double tragedy in the post war Irish conflict. This book is supported by four pages of photographs and numerous maps and illustrations.